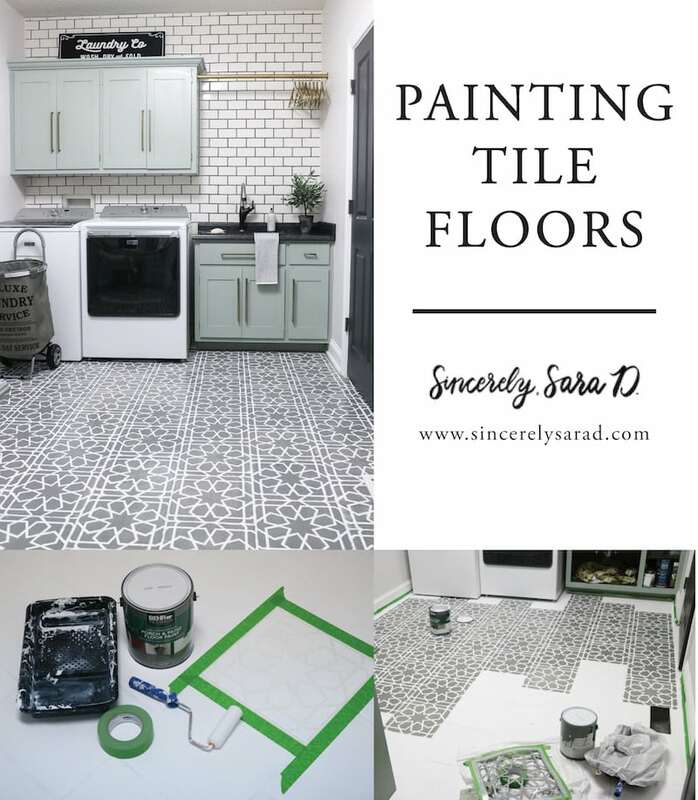 Painting Tile Floors - Sincerely, Sara D.
I’ve painted a lot of things, but I haven’t attempted painting tile floors…until now! 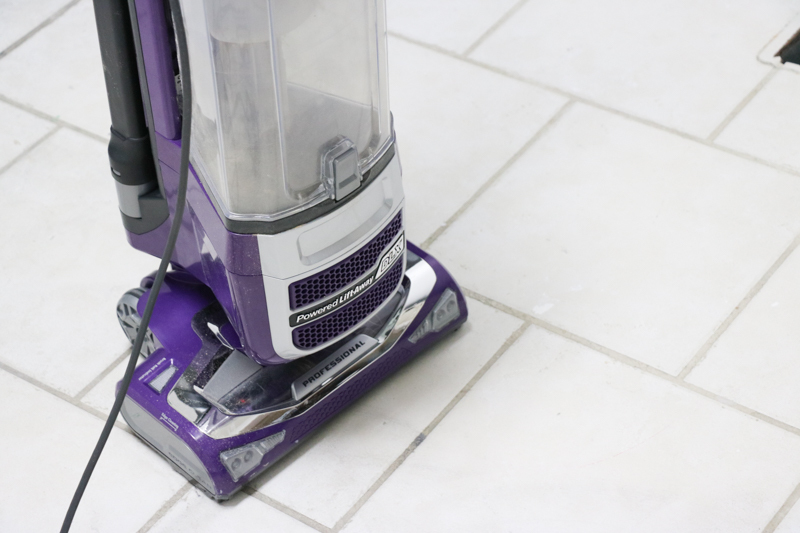 To begin, sweep floors with a vacuum. 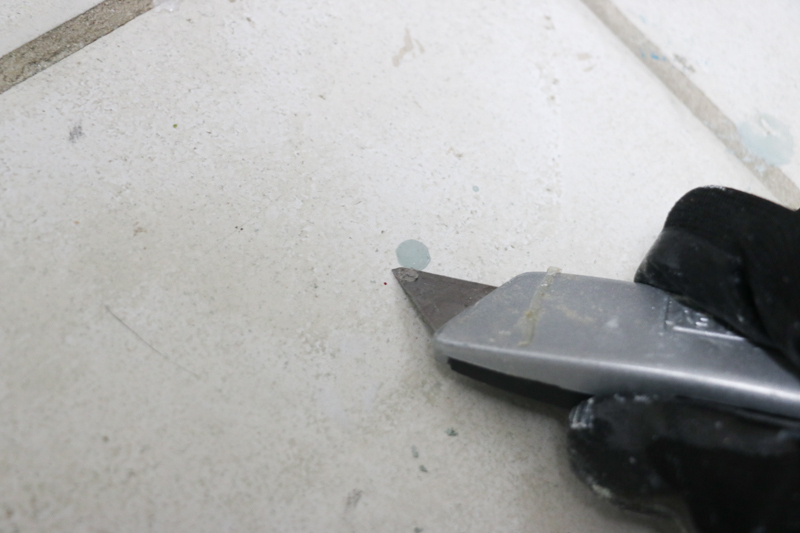 Next, use a razor and remove larger spots (I had paint spills and gunk everywhere). 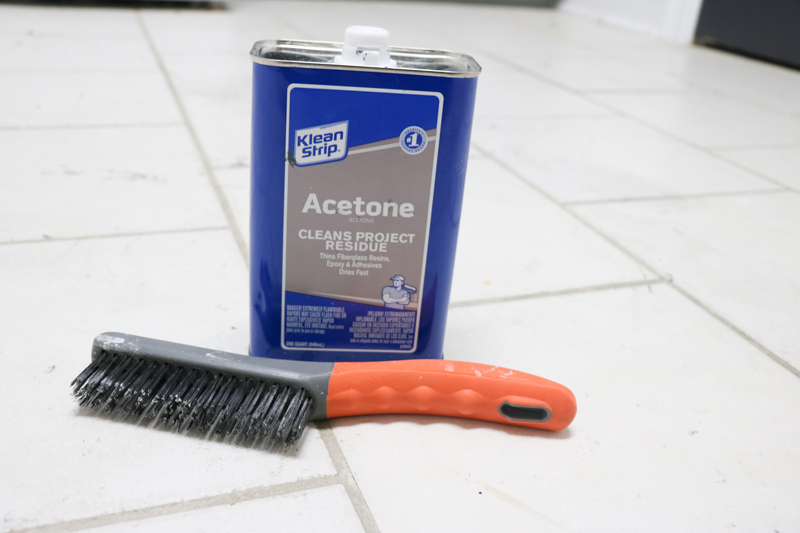 Use the acetone and a wire brush to clean the tiles. 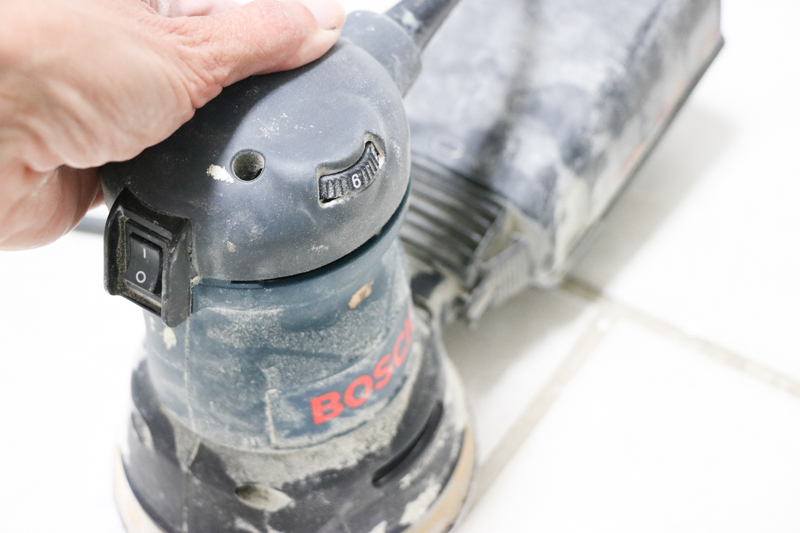 After cleaning, sand the floors to remove as much gloss as possible. 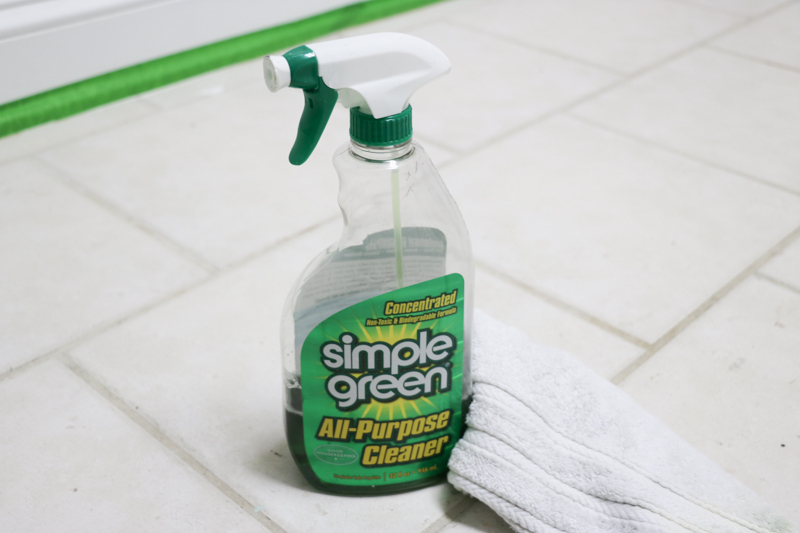 After sanding, vacuum again and clean the tile with Simple Green and a rag. 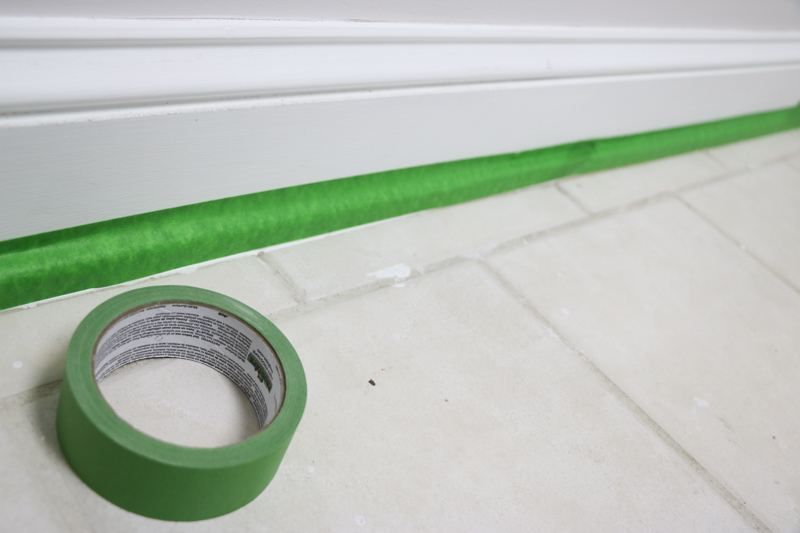 Tape off all the baseboards. 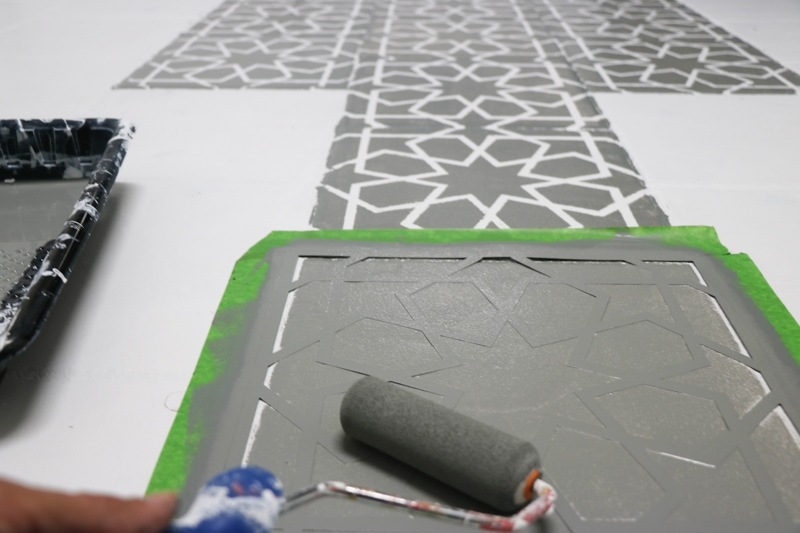 Prime the entire floor using a roller and paintbrush for the hard-to-reach areas. 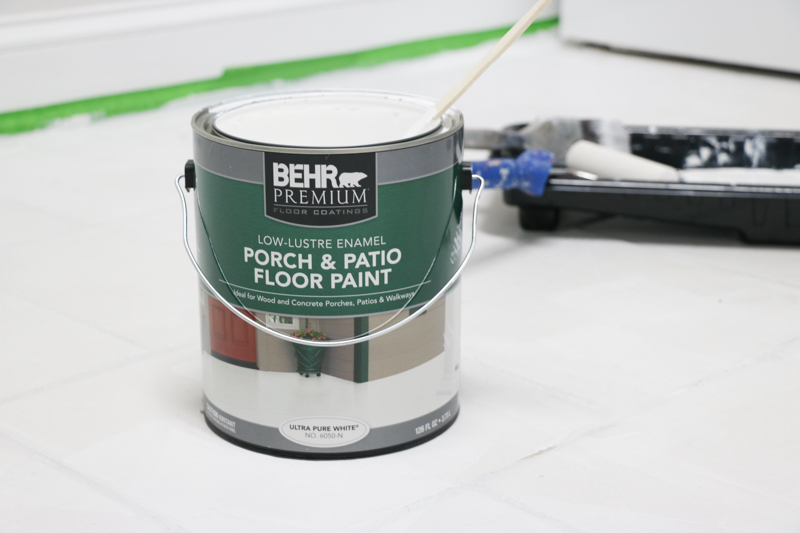 Once the primer is completely dry, paint the floor with two coats of BEHR’s Porch and Patio Floor Paint. 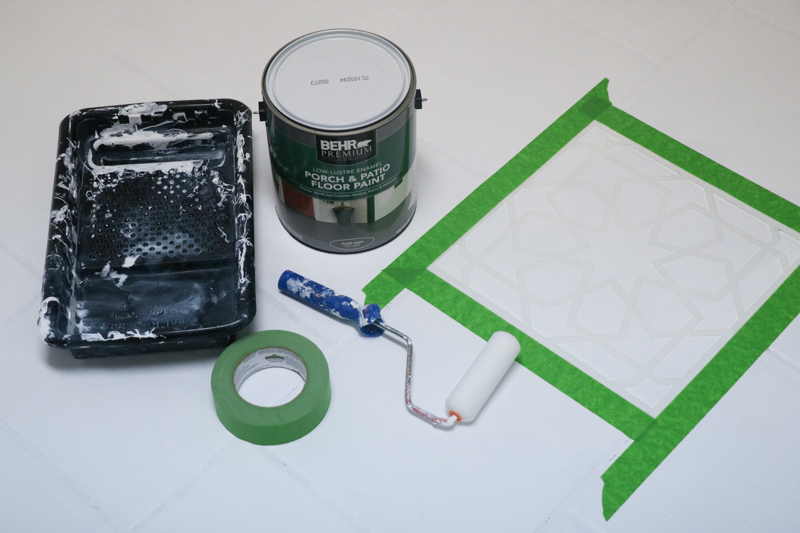 After that is dry, you can begin the (optional) stenciling. Let me warn you, this will take FOREVER and lots (and lots) of patience. 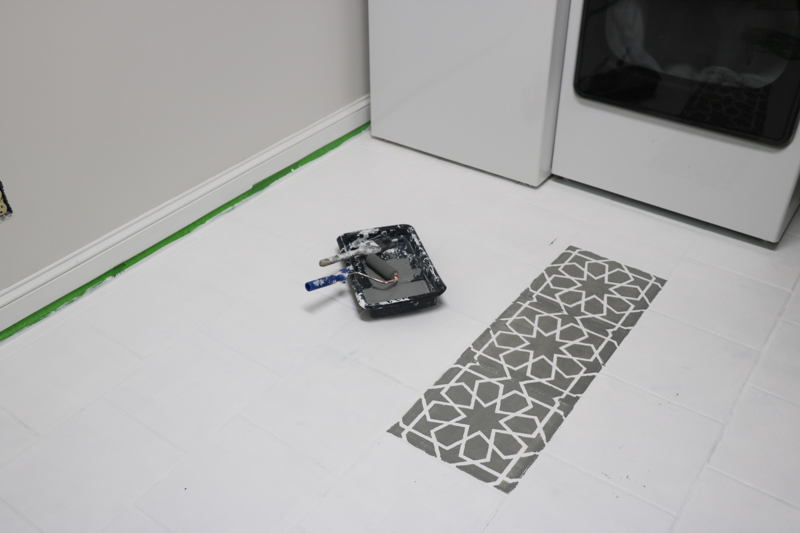 I used the Rabat 12 inch tile stencil from Royal Design Studio and have 12 inch tiles, so my stencil was square-by-square. I would do several stencils, and take a break to let them dry. Make sure to cover the paint and roller so they don’t dry out. Slowly the pattern began to come together. 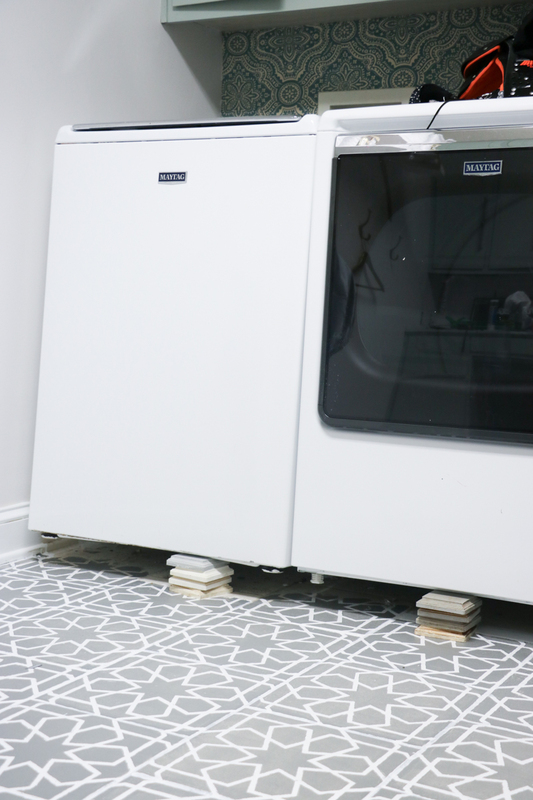 Rather than deal with take the washer and dryer out, we elevated them so I could paint several inched under them. I finished with several coats of polycrylic (applying with a foam roller). And my floor was complete! 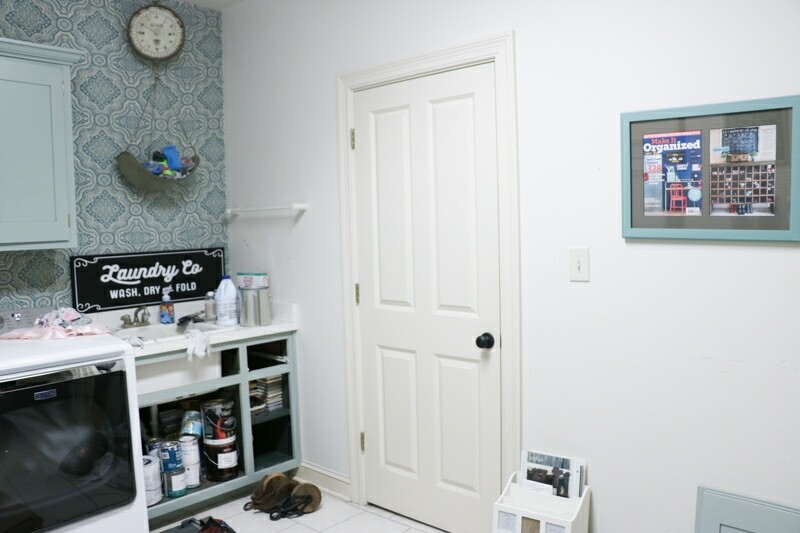 I used BEHR MARQUEE paint for the laundry room walls and doors. It’s amazing paint because it has a one-coat hide guarantee, and it is very durable. 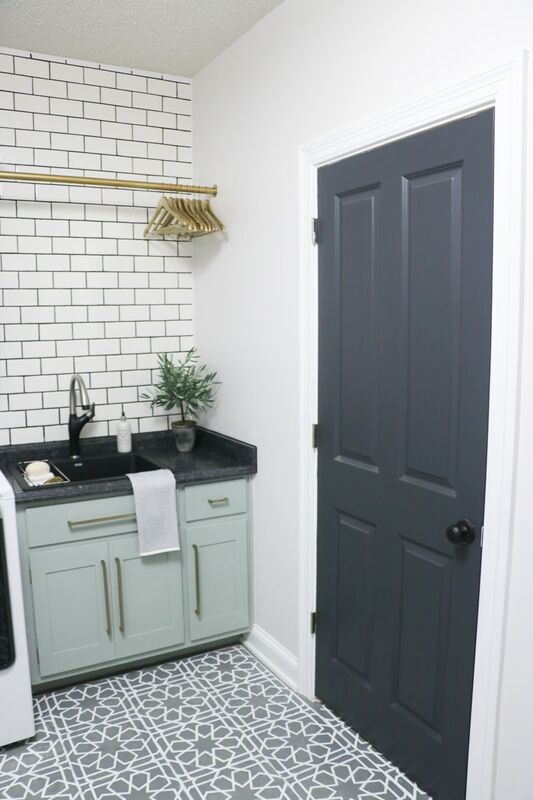 I used Orion Gray for the doors and Cameo White for the walls. 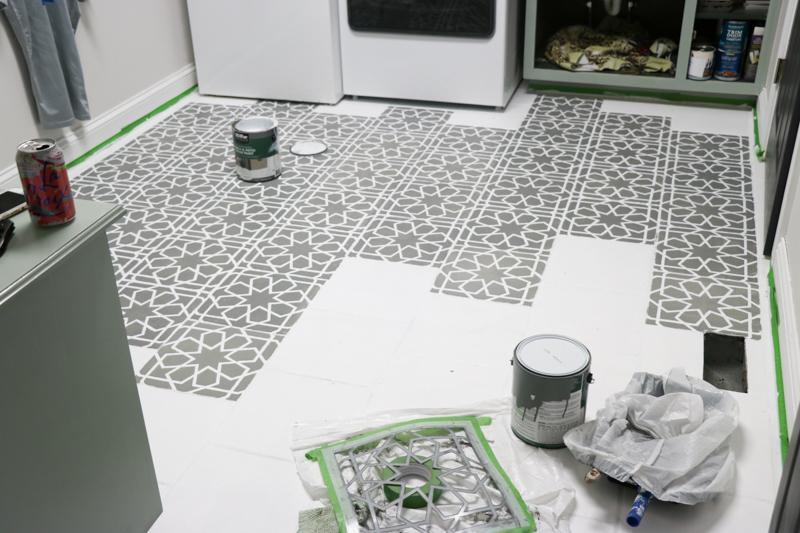 I’ll keep you posted on how the painted tile floors hold up! 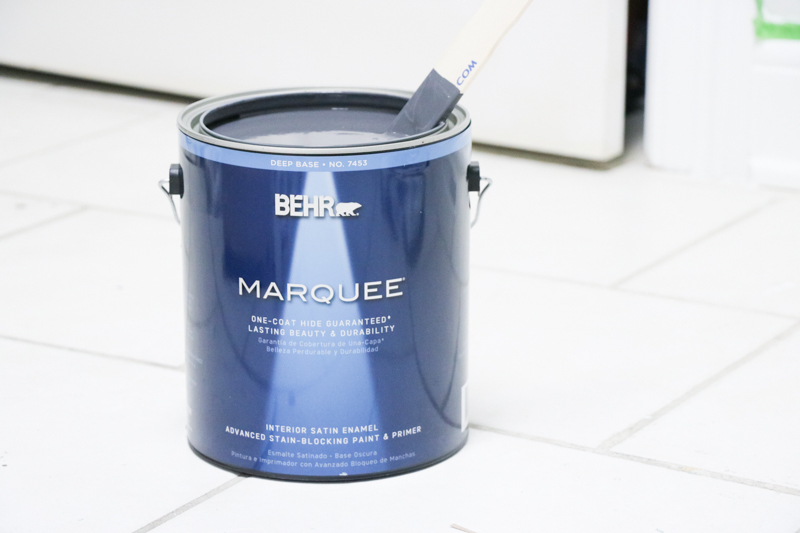 *This post is a sponsored post by BEHR paint and Royal Design Studio. I take pride in reviewing only products that fit my brand and will be beneficial to my readers. And while this post is sponsored, all the opinions are my own. This looks so beautiful. 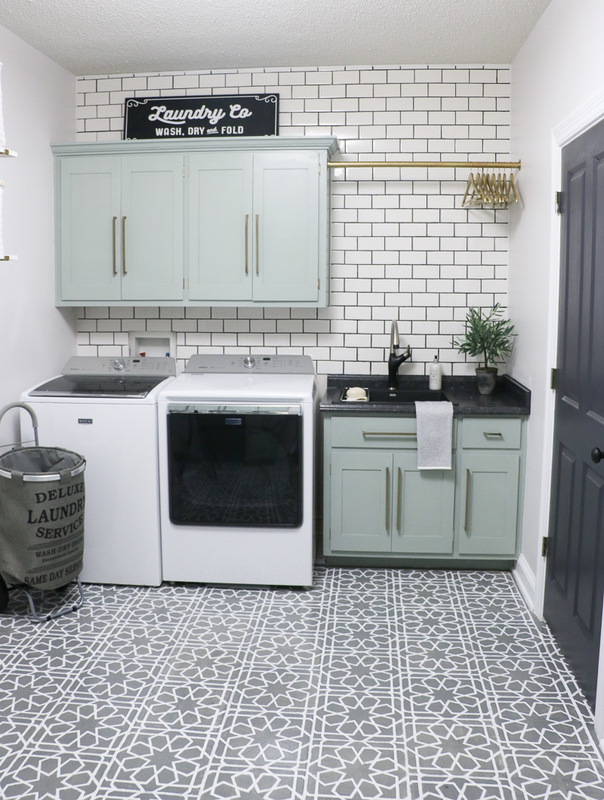 I can’t wait to try it in my laundry room! Where did you find the gold hanging rod? I need to do that too!! 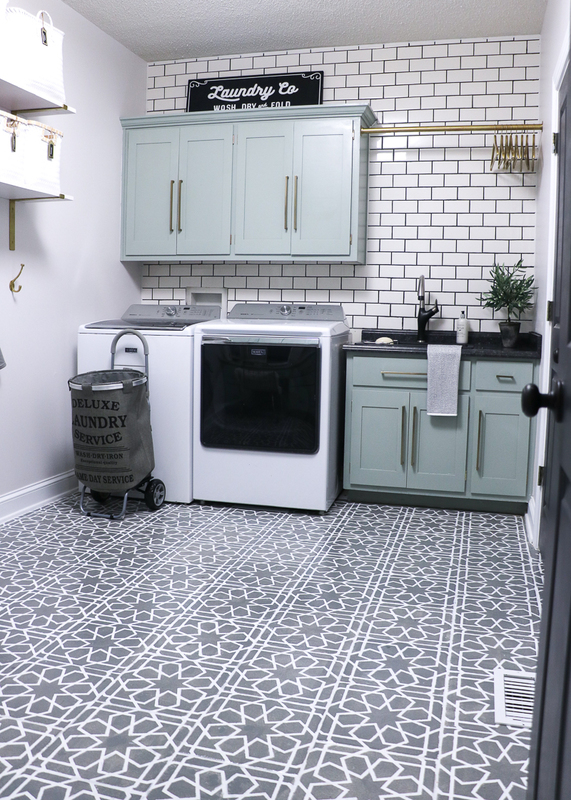 I have been trying to find a great option for hanging my clothes in my tiny laundry room for a year, and this looks awesome! 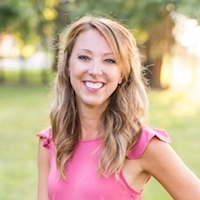 Hi Leigh – it’s just a wooden rod that I spray painted gold! How is this holding up? 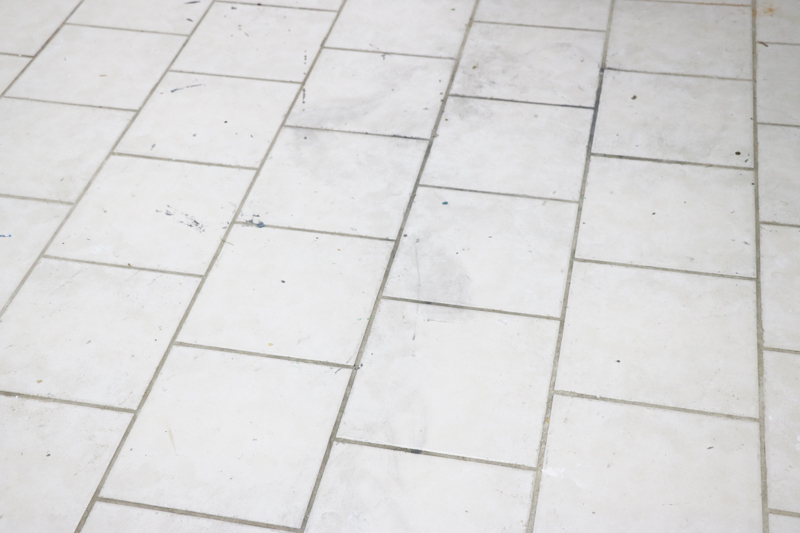 I have quite a few tiled floors in my house that I am wanting to paint. I need to do a post on how it’s holding up a year later. I’m disappointed with the amount of scratches I have. Luckily the pattern hides a lot, but I’m not happy with it’s (lack of) durability. Looks beautiful! How is the paint holding up? 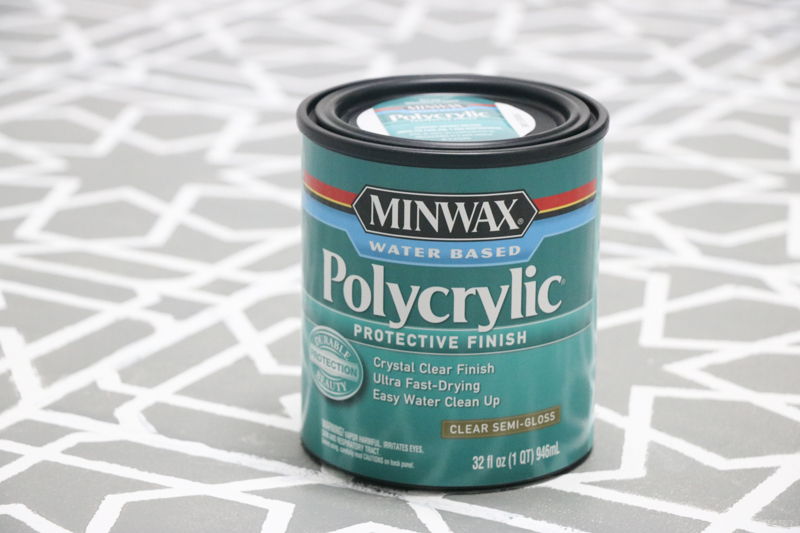 Did you also use the porch and patio paint for the dark color that you stenciled on? I painted my pantry floor with chalk paint and covered it with a sealer but parts of it have chipped off. Just wondering how this paint has held up for you? Thanks! Hi Sharon! It’s been about a year, and I need to do a post on how these painted tile floors are holding up. I’m actually pretty disappointed. I used porch and patio patio for both colors, and there is a lot of scratching a chipping happening. I’m sorry you’re having similar problems! Amazing job! 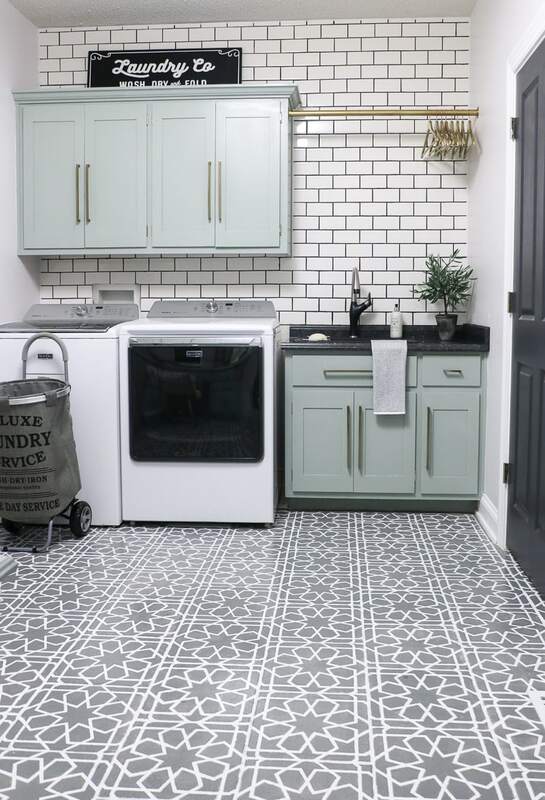 I want to do something like that for my laundry room. I have the builders grade vinyl. Would your method work for vinyl? 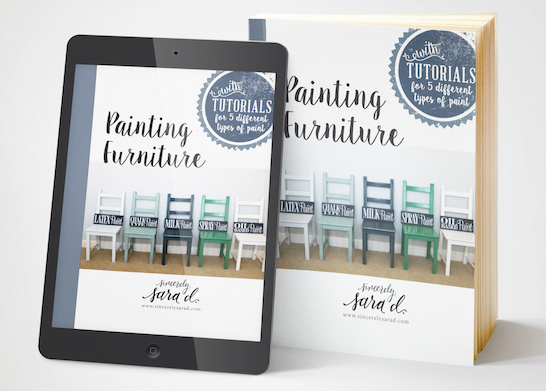 Hi Sheila, Unfortunately I don’t know if this method would work, but I have seen painted vinyl floors out there! Good luck with your project!